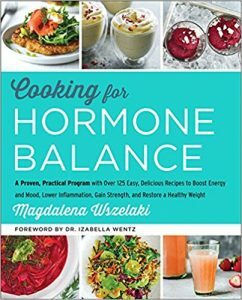 Cooking for Hormone Balance: A Proven, Practical Program with Over 125 Easy, Delicious Recipes to Boost Energy and Mood, Lower Inflammation, Gain Strength, and Restore a Healthy Weight by Magdalena Wszelaki, HarperCollins Publishers, New York, 2018. 374 pp. Cooking for Hormone Balance is truly a protocol cookbook for hormone balance, boosting energy & mood, lowering inflammation, gaining strength and restoring healthy weight. I particularly love the information about environmental toxicants and guides to reduce toxins applied to skin and taken internally. This has become my new favorite cookbook to use and to recommend to my patients who want to become more skilled in choosing to make their food be information and medicine for their bodies. Magdalena Wszelaki is an integrative hormone and nutrition expert who knows that symptoms of her own hormone imbalances including hyperthyroidism, followed by Hashimoto’s, then adrenal fatigue and estrogen dominance resulting in symptoms such as stubborn weight gain, fatigue, brain fog, depression, insomnia, digestive issues are reversible. Dr. Kelly Brogan, author of A Mind of Your Own, describes Cooking for Hormone Balance as a “healing toolkit…[to learn] the true nature of hormonal balance and the practicalities of how to shift into vibrancy and vitality” with these recipes, recommendations and protocols. Wszelaki divides her book into 4 Parts: Part One focuses on healing your digestion, balancing your sugar levels and understanding how to detox your liver for hormonal balance. Part Two focuses on refining your hormonal balance. Part Three focuses on stocking your kitchen and traditional food preparation techniques like soaking, sprouting fermenting and cooking with organ meats. Part Four includes the food apothecary, and the delicious, health restoring recipes. With a nod to Julia Child, whose cookbooks remain on my shelves, I bid you bon appetite.